#DOBvSBP Judge to jury: We have agreed questions on which the parties want your verdict. All questions are agreed and they are on an issue paper. It's been agreed you see this paper before the [closing] addresses. #DOBvSBP Judge to jury: Please pay particular attention to what counsel have to tell you. It’s extremely important and if you wish to make notes, you’re entitled to do that. McDowell will address the jury first. #DOBvSBP Issue paper has been circulated. Judge has asked jury to take a few moments to read it. #DOBvSBP McD: It's my client's [Post Publications Ltd] case and the case I’m making to you: that this case should be thrown out in its entirety. That’s what I’m asking you to do. You've heard from 3 witnesses: Denis O'Brien, Tom Lyons and Ian Kehoe. #DOBvSBP McD: Who brought in evidence that is false? There have been accusations of malice against these two men [Lyons and Kehoe] without any basis. Who claimed he had correspondence to prove the points he was making and failed to produce it? #DOBvSBP McD: DOB has come here to seek a verdict in damages because he wants to effectively exercise power over the Sunday Business Post. #DOBvSBP McD: That's what he's asking you to do...to find that these two men maliciously decided to damage his character. If you come to the conclusion that that’s a false, wild claim - I will ask you find accordingly and throw this out lock, stock and barrel. #DOBvSBP McD: I put it bluntly, in black and white, there is no middle ground in this case. Says either DOB's claims about the meanings of the articles are either "incorrect or correct". "If incorrect, this case fails"
#DOBvSBP McD: Now you will be told - because it always happens in defamatation cases - that DOB is only hear to vindicate his character. #DOBvSBP MCD: You'll be told he's been forced to come here and that he's somebody who is a victim of a defamation, who we [SBP] have wrongly forced to come here seeking restitution…that is not the case. It's simply not the case. #DOBvSBP McD: He is seeking damages from you by way of an award...that's what he's doing. He didn't have to make that case. #DOBvSBP McD: I say all that because the notion he is a victim is respectfully wholly unsupported. #DOBvSBP McD: First of all, number one, if that were true, it would be the same in respect of all of the people mentioned in the articles. McD tells jury if was the case DOB was defamed then the other 21 borrowers in the articles would be taking similar action but they're not. #DOBvSBP McD argues if the defamatory meanings of the articles (as suggested by DOB) are true then "they're true of all of them". McD: They've [other borrowers] not brought cases. If they didn’t defame all of them, how is it the case that they defamed DOB? #DOBvSBP McD tells jury that this account from TL and IK is true. He says Lyons's evidence that RTE asked him not to mention Denis O'Brien in a radio interview - about the March 15, 2015 SBP reports - "corroborates this account". #DOBvSBP McD: They [TL and IK] had the articles looked at by lawyers. #DOBvSBP McD: Do you think an editor would do that? Do you think for one minute that the editor and deputy editor said: 'let's defame Denis O'Brien, let's say things we know are untrue and let him sue us'. #DOBvSBP McD: Or is the case that they were especially careful and that they had it in mind that he might sue and they were especially careful to make sure there was no defamatory material about him? #DOBvSBP McD: You’ve to ask yourself: which is more likely? Would the editor of a newspaper in these circumstances sit down with Tom Lyons and say ‘let’s see how far we can go…let's deliberately put wrong things in and do damage to him because we have an agenda against him..'? #DOBvSBP McD: You’ve heard DOB, TL and IK give evidence. I have to ask you, when you consider your verdict: Who was trying to tell you the truth? Who was irresponsible? Who was willing to damage others and impute false motivation towards others in the evidence they gave? #DOBvSBP McD: ...and who was giving evidence trying, at the very best, to be honest, truthful and honourable journalists? Acting in the best interest of their newspaper and their readers? #DOBvSBP McD: And if you consider the two sets of evidence [DOB V TL and IK] it becomes immediately apparent that they [TL and IK] were doing their best to be truthful... in dealing with trenchant cross-examination ....and sometimes sarcasm. #DOBvSBP ... in the version of the PWC report which the Banking Inquiry obtained and which DOB's counsel introduced to the proceedings last week after Denis O'Brien gave evidence. #DOBvSBP McD said some of DOB's remarks were "vicious". #DOBvSBP MCD: Why did he say that? Where does the malice lie when he makes claims like that? #DOBvSBP McD said Morrissey "attacked Mr Lyons in a disgraceful way, a really disgraceful way". #DOBvSBP MCD [contd]: ...but it later transpired in the witness box that, under no circumstances, would be verifying that figure. #DOBvSBP McDowell goes on to list the property interests that he and his solicitor could find on Google..this includes properties he owns/owned in Dublin, Cork, Portugal, etc. #DOBvSBP McD says that was a "folksy, phoney, false account"
McD: I'm asking you [the jury] was he honest? Would a businessman like him put a property on the market for €220m and then take it off the market in those circumstances? There's a ring of falsity to that. #DOBvSBP MCD: That doesn't mean that he’s not also a communications entrepreneur. #DOBvSBP McDowell goes to the correspondence between Denis O'Brien lawyers and those of the SBP after the publication of the articles on March 15, 2015. McD says that the language in the letter from Meagher solicitors to SBP suggested that DOB was "looking for a fight". The other man: I'm not. The man making the claim said to man next to him: Was he looking at me? First man: Are you calling my brother a liar? #DOBvSBP MCD: This is the aggressive fight-seeking language... Is it an honest evaluation of the articles? Of course it isn't..
#DOBvSBP MCD: Nobody was allowed mention DOB in this newspaper…in any copy..do you seriously think anyone would say DOB is a criminal?…Of course they didn't...but they [DOB legals] were spoiling for a fight. #DOBvSBP MCD: He could have written a letter saying ‘you were very unfair to me’. [Reading from a letter] McD says: His solicitor says ‘we have to hit them with a plenary sunmons’..that’s what he says and that where this case begins..was it sensible? #DOBvSBP McD seeks to "be clear" about what malice is. #DOBvSBP MCD tells jury DOB is claiming that the SBP took DOB's Anglo indebtedness which was "already old hat" and "decided to reheat it and that shows they were acting maliciously"
#DOBvSBP McD tells jury that DOB said in his evidence that "he wouldn't put it past" Tom Lyons to do something like that.. McD later corrects himself as he misquoted DOB. McD later tells jury that what DOB said was "Well it’s not beyond Mr Lyons..."
#DOBvSBP McD is referring to the image below. McD said DOB initially said he didn't know if he was one of the 22 top borrowers. 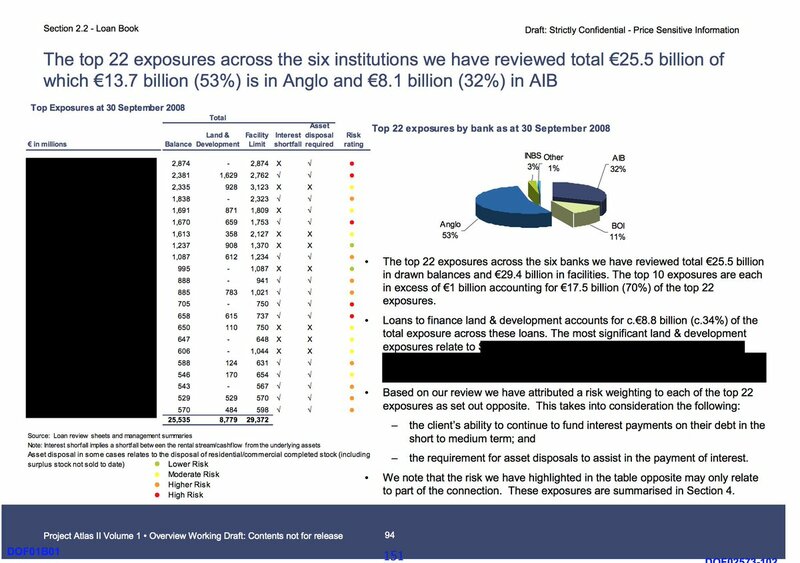 #DOBvSBP MCD: They said ‘that’s us’ and then they changed their tune completely ...and they asked Tom Lyons if he saw the colour coded marks on the image about the borrowers' risk ratings. #DOBvSBP MCD claims it was essentially put to Tom Lyons that he "perverted the meaning of the table by by not telling readers that". #DOBvSBP MCD says there was no need to start talking about his credit. MCD says "it was irrelevant" because the SBP had "given him a clean ill of health"
MCD: But that's not good enough for DOB either...because they said SBP "invented the black and white version" of the report..
#DOBvSBP [contd] MCD:...and they claimed SBP unfairly and in a defamatory way failed to bring that to attention of readers..
#DOBvSBP McD: So not merely is he [TL] an irresponsible journalist [in DOB's eyse] but he's also guilty of committing perjury and inventing a reason for not paying attention to a colour coded table. #DOBvSBP McD: They [DOB] wanted him [TL] to say he had a good credit rating. And again the answer of the two journalists is 'we gave him best credit rating…we said paid his debts, interest and was one of best customers of the BOI and AIB', etc..
#DOBvSBP McD: But that’s not good enough for DOB. #DOBvSBP McD: It’s convenient is it not that DOB was out of the witness box [when the Banking Inquiry slip was produced] and "and comes just in time to cross-examine Tom Lyons when he had never seen it before...You ask yourself: was that fair? #DOBvSBP McD: It's very easy to make changes in court…you can suggest to anyone that they're lying though their teeth…and there's no consequence except the verdict of jury…that’s the only consequence..
#DOBvSBP McD recalls how it had been previously said that DOB got an apology from INM over the Sindo Anglo article co-written by Nick Webb and Tom Lyons..
#DOBvSBO McD highlights how DOB pitted the Sindo article of 2012 as "an example of good editorial control", about which he took no action, against the SBP "malicious" articles of 2015. #DOBvSBP McD: You know from this documentation, the stream starts with Mr Lyons asking DOB (via JM) for details of his indebtedness [for the Sindo article]. McD: You know that. And who else knew it at that time? The recipient of that email: James Morrissey. #DOBvSBP MCD: Mr Morrissey who has been in court here frequently. #DOBvSBP MCD: Yet they have cheek and dishonesty...to write to his boss [Nick Webb] to say he’s falling below press standards. MCD says the email to Nick Webb was "scandalous and vicious" and was "only capable of being written by someone who is malicious"
#DOBvSBP MCD points out that this complaint about Tom Lyons was made on behalf of person who is 21% shareholder at INM. MCD: How vicious to do that to a young upcoming journalist, by a man with 21% of share in the company. #DOBvSBP MCD: What kind of contorted, evil brain does that? #DOBvSBP MCD: And what’s worse is DOB didn’t distance himself. He said he agreed with Mr Morrissey’s complaint. #DOBvSBP MCD: When DOB said some figures were wrong…I asked: were they materially wrong? He said 'I’m not going to answer that Mr McDowell, it's none of your business'. It's the same pattern: complete hypocrisy. #DOBvSBP MCD: Why is this relevant? DOB comes in here and thinks he’s just going to "wing it with loose and untrue evidence"
#DOBvSBP MCD: So he diid a quick u-turn for being exposed as a liar. #DOBvSBP McD: There's not one word of demfamation, untruth, or criticism about Denis O'Brin in these articles. #DOBvSBP MCD: Articles don't suggest he was insolvent or his debts exceeded his assets or that he was unable to repay his loans. #DOBvSBP MCD tells jury: I defy you to find one word in the articles (which amounted to more than 6000 words) that said he was borrowed recklessly. #DOBvSBP MCD also tells jury that an opinion piece written by Gavin Sheridan (which SBP says was about the Banking Inquiry) contained nothing which was defamatory of Denis O'Brien. #DOBvSBP MCD tells jury that defamation law, in Ireland, states that when ana article is being examined to see if it's defamatory or not, the jury is obliged to have a "reasonable reader" in their mind AND that this reader read the "entire article". #DOBvSBP MCD: There was no defamation of DOB whatsoever - good, bad or indifferent. This is an artificial case and an exercise in 'looking for a fight, spoiling for a fight..a case with no merit whatsoever. #DOBvSB MCD: Did they set out to deliberately print something about him which is untrue? Look at them, look at them: they didn't. #DOBvSBP MCD tells jury DOB has "a casual relationship with the truth". MCD says DOB is not pursuing the SBP out of money "but because he wants to put down people who are decent, honourable and truthful....journalists who keep our democracy going by telling the truth"
#DOBvSBP MCD continues..."People who are well-motivated, truthful, get articles lawyered..."
MCD: Don’t fall for this phoney effort to persuade you that this man was defamed..
I’m asking you to throw this out unceremoniously. #DOBvSBP MCD: Tell DOB to take this case and put it... where it ought to be. @threadreaderapp unroll please. Thank you. It's barely 615 am and already more than 50 (?) journalists are lined up outside Federal District Court in Brooklyn to hear the government's closing arguments this morning at the Chapo trial. Packed into the courthouse vestibule like a crowd at a rock concert, they're at least out of the subfreezing New York wind. At one point this week, court officials were considering opening a second overflow courtroom for the crowd but decided not to at the last moment. Prosecutors are expected to spend much, if not most, of the day taking jurors through the epic case. There are 10 counts in the indictment and the trial testimony spanned nearly 30 years of Chapo's career, from his peasant days in La Tuna to his height of narco lord opulence. the defense is expected to rest this morning in the trial of james alex fields. we should be hearing closing arguments this afternoon. we’re expecting to hear from the defense’s final two witnesses before lunch, but at this point i don’t know what to expect from this meandering, unfocused defense. headed in now for what i hope to be the end of this stage of the trial. more soon. Closing arguments this morning in the U.N. corruption case, and the government still has not publicly released a single exhibit shown to the jury. This is unacceptable for a public trial that almost has concluded, @SDNYnews. Update on the public access: Many - though not all - of the exhibits are now publicly available. 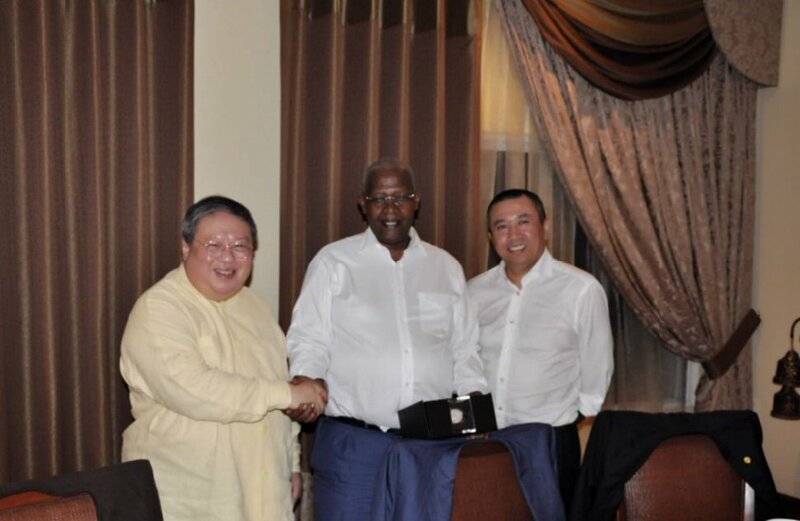 Here's a picture of defendant Chi Ping Patrick Ho shaking hands with Uganda's autocrat Yoweri Museveni, who's held power since 1986. 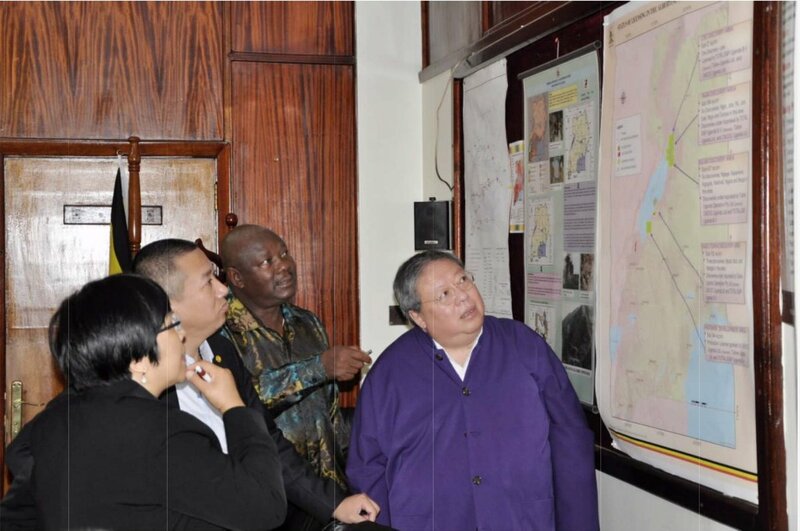 At right, Ho gazes at Ugandan oil fields map. Wagner says Samsung pays him $795 per hour, and Apple's damages expert Julie Davis charges $900 per hour. Wagner testified yesterday that he has worked over 8,000 hours on the case since 2011. So he's made about **$6.36 million** by my tally.